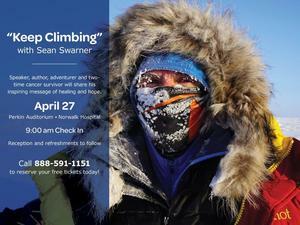 On Saturday, April 27, 2019, Norwalk Hospital will be hosting Sean Swarner, a two-time cancer survivor, author and adventurer who will share his inspiring message of hope and healing at 10 AM in the hospital's Perkin Auditorium. Sean has climbed the highest peaks on all seven continents, crushed the Ironman World Championship and run the Boston and NYC marathons - all with one lung! Tickets to this event are free, as is parking. Light refreshments will follow the presentation. Please call 888-591-1151 to reserve your free tickets.